One of my favorites of the Buffalo Trace Antique Collection, Sazerac 18-year-old rye whiskey is also the oldest in the collection. Yes, technically, Eagle Rare 17-year-old was actually 19-years-old a few times. This year’s release is also the last of the original batch distilled way back in 1985. Once that batch reached maturity at 18 years, the whiskey was transferred to stainless steel vats to stop the aging process. Next year’s 2016 release of Sazerac 18 will be whiskey distilled back in 1998. Being a member of the Buffalo Trace Antique Collection means there is not a lot of this to go around. There are 25 barrels worth of whiskey, minus a 58.48% evaporation. The whiskey is chill-filtered and proofed down to 45% abv. How I’d love to see (more specifically taste) a non-chill filtered, barrel-strength version of Sazerac 18. A guy can dream, can’t he? As this whiskey is technically the same whiskey released for the last few years, my tasting notes are similar. The nose is allspice, rye grain, ginger, molasses, fruit cake and oak. Full bodied at 90 proof, Sazerac 18 also comes across a little dry. I get oak, ginger, rye grain molasses and toffee candy. The finish is long, with slightly drying oak and a small mint kick on the backend. 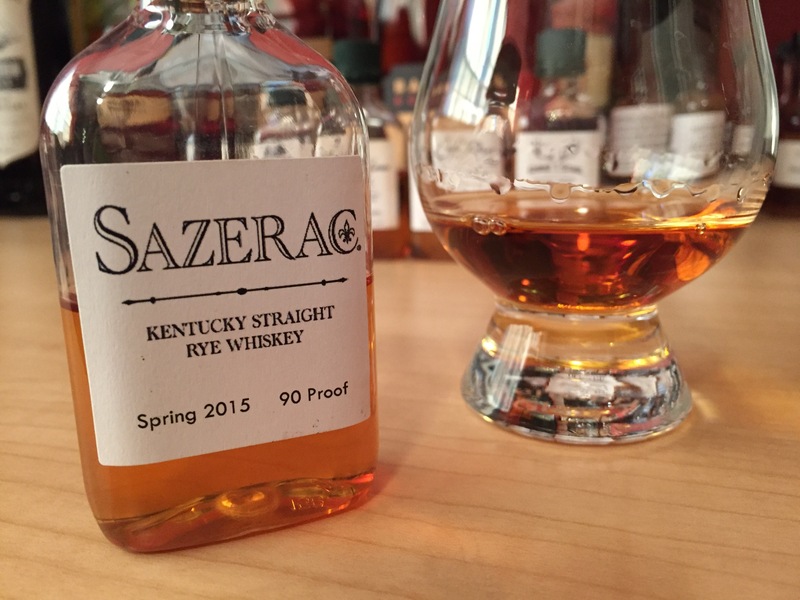 The last three releases of Sazerac 18-year-old rye whiskey have been among my favorites. Everything you expect from a well aged rye whiskey is here, and more. Again, this is the last of the vatted whiskey. I look forward to next year’s release for comparison. In this meantime, I’m going to finish off this small 50ml sample of this elegant, exceptional whiskey and figure out a way to acquire a bottle. It’s an almost impossible task to find one, let alone for the SRP of $80. Highly recommended.